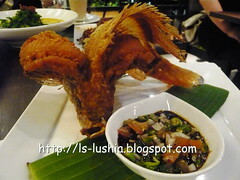 Dancing Fish serves Malay Indo Cuisine with their signature fried fish. 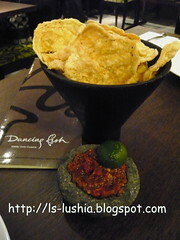 Started our dinner with Emping Sambal Terasi as appetizer . Emping, made of melinjo nuts, nutty and slightly bitter in taste blends well with sambal terasi. 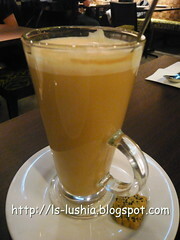 Had a glass of cucumber latte to satisfy my craving for coffee before starting dinner. 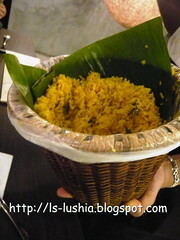 And the yellow rice, it's extremely good! 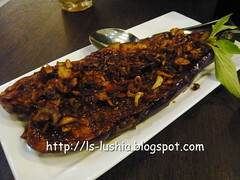 Grilled Terong (Eggplant) topped with sambal (chilli paste), vegetable and fried onions- Sweet, spicy with assam. -Appetizing! 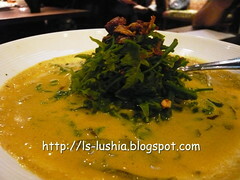 Gulai Pucuk Paku, fernleaf with aromatic tumeric curry topped with anchovies and fried onions. 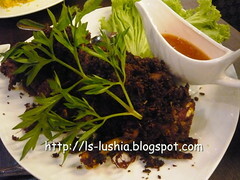 Bebek(Duck) marinated with special mix of Balinese herbs and spices for 24 hours fried till crispy. Served with salad and chilli sauce- Awesome! And here comes the signature dish- Dancing Fish! Opted for fried tilapia served with sambal terasi and soy sauce. Other choices are Masam Kedondong Pedas, Belimbing Salad (Starfruit salad), Mango Kerabu and Tangy Acar. 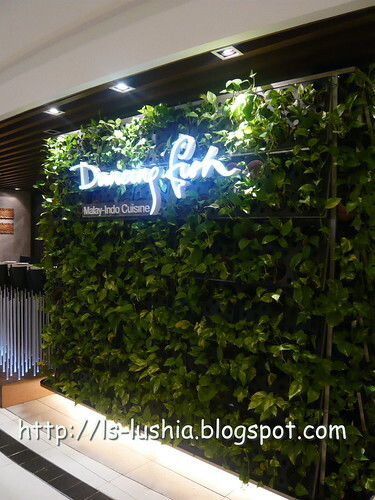 Dancing fish, a restaurant with good food and comfortable environment. Enjoyed my dinner here!